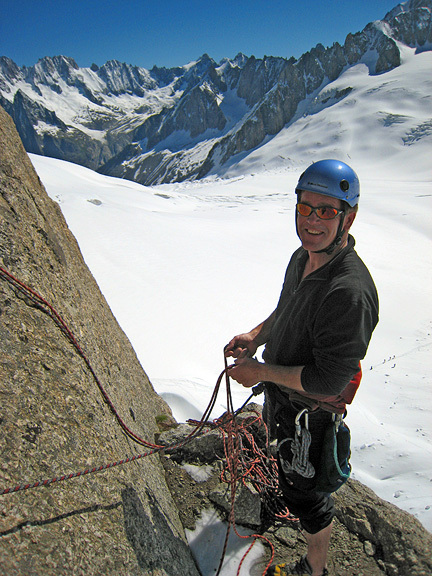 Ken Seamon from Cambridge, UK was back to climb with Kathy again this year. Arriving in very wet and stormy weather, it looked at first as if he would be climbing in the fog again all week. But things did improve, and by the time his trip was over, heat was beginning to be the problem "du jour". Trying to keep nimble and respond to daily conditions, we hopped around quite a bit to make the most of each day. On day 1, the forecast called for a modicum of rain, but no real thunder storm risk, so we headed up to the traverse of the Crochues once the drops tapered off a bit. 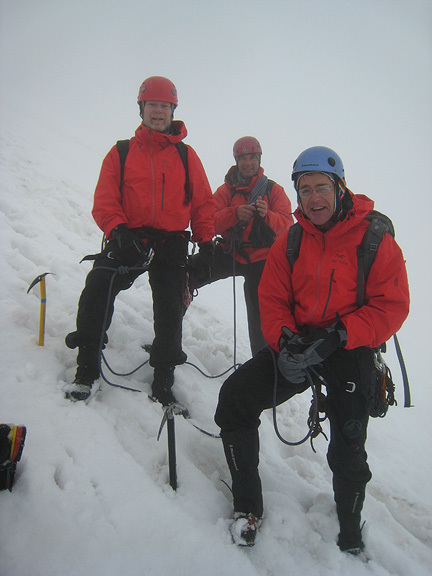 Here, Ken belays Kathy up the chimney pitch, while Mark, Norm and Kurt appear out of the mists below. 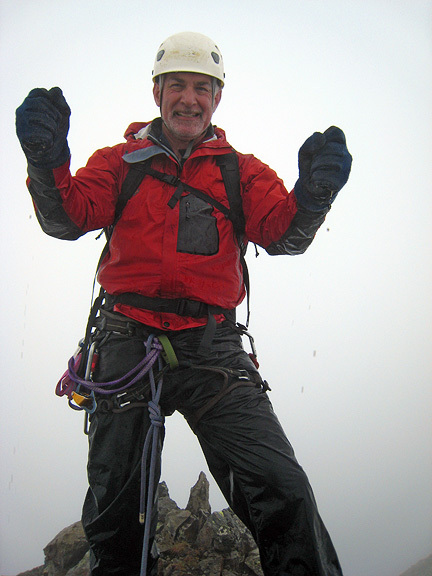 At the high point, Ken wrings the water out of his sodden gloves. No views, but it was good to get out and play in the weather. 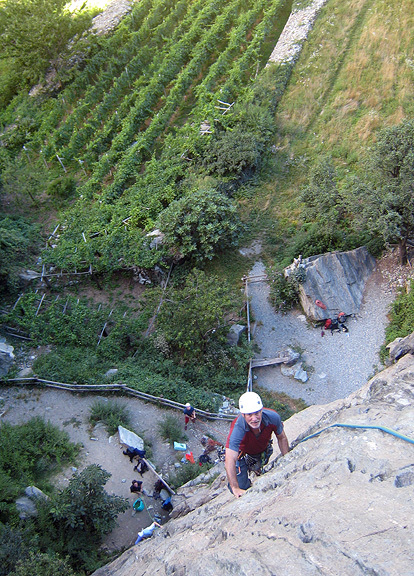 The difficulties over, we pause to un-rope and descend together with Mark, Norm and Kurt. The following day turned out to be significantly dryer south of the Mont Blanc massif, so we piled into the car and drove through the tunnel to the Aosta valley. Ken here on pitch 1 of Toppo Pazzo, a lovely 3 pitch climb above the vineyards in the Machaby area. No sodden gloves on this one! Another drizzly, misty day was spent getting to the Albert Premier hut, after which we finally got the clear, cold dawn we had been waiting for. 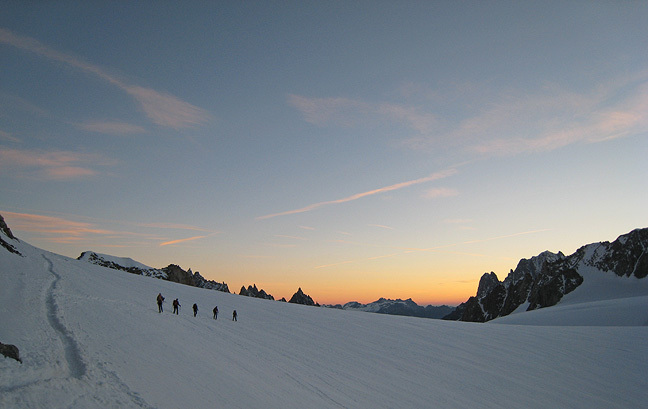 Here, residual lenticulars add mystery to the summit of the Aiguille de Chardonnet at sunrise. 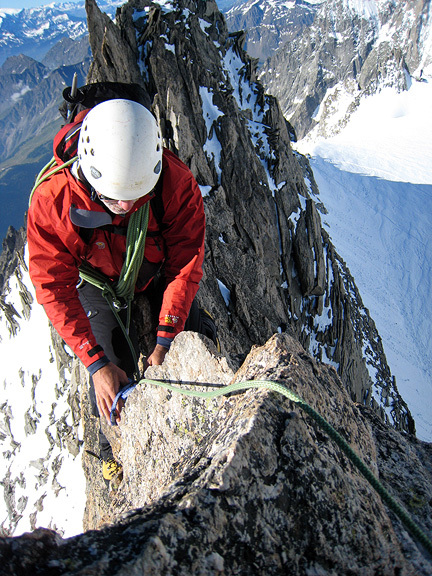 Our plan A was to do the Rock Table Spur on the Aiguille du Tour, which is the right-hand skyline here (the table is visible perched near the ridge if your eyes are really, really good). But new snow and rime ice conditions did pose a challenge. For example! 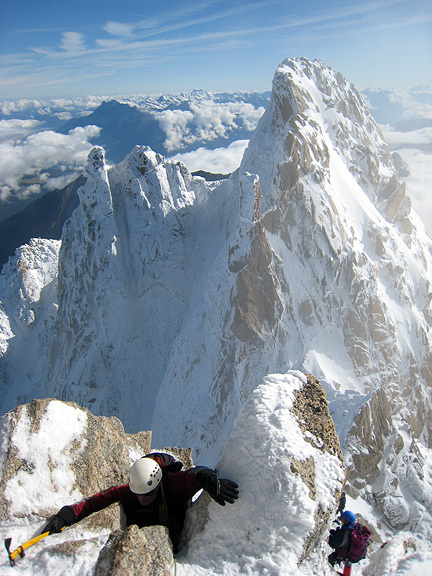 Beautiful, but rather a deterrent from getting on the steeper rock sections of the Table Spur. 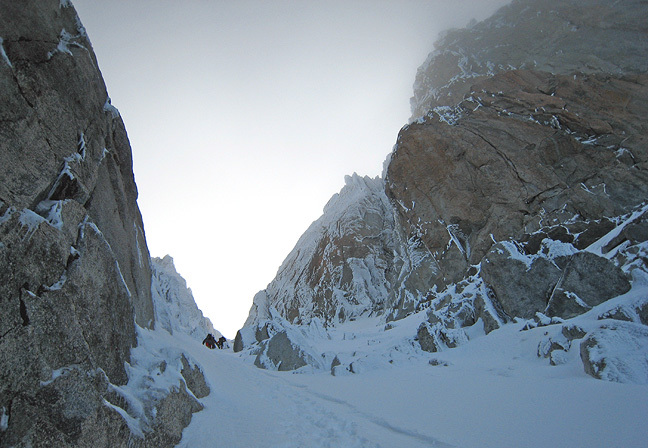 The adjacent "Table Couloir" had it's own problems, namely a large deposition of snow that had not had time to stabilize. 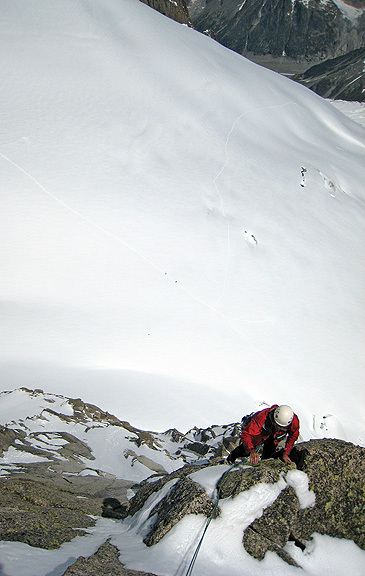 So we defaulted to a shorter, narrower but still steep couloir nearby, that gave access to the Normal Route on the opposite side of the mountain. 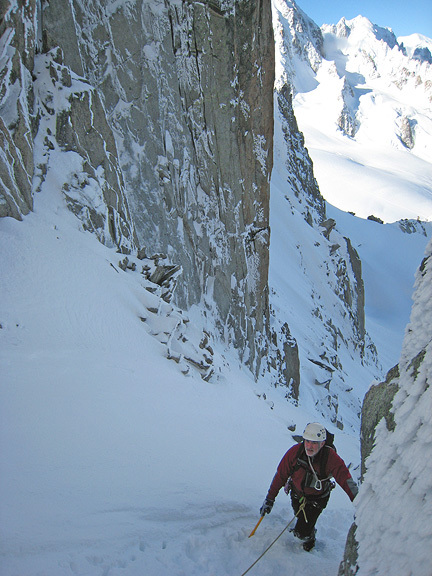 Ken approaches the top of the couloir, above an hourglass-like narrows. 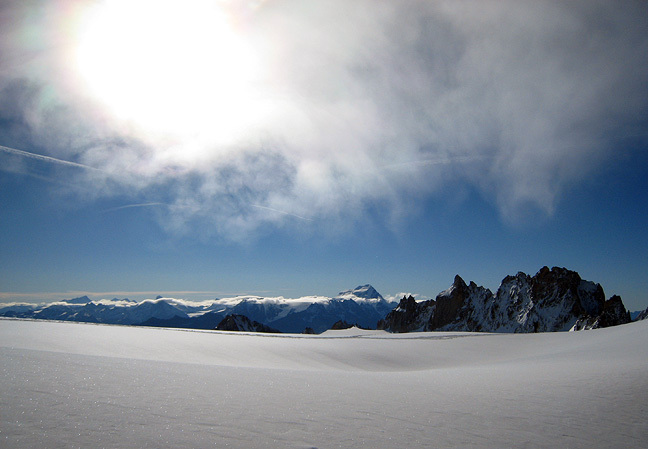 Once through the col at the top of the gully, this gorgeous view over the Trient glacier rewarded us. 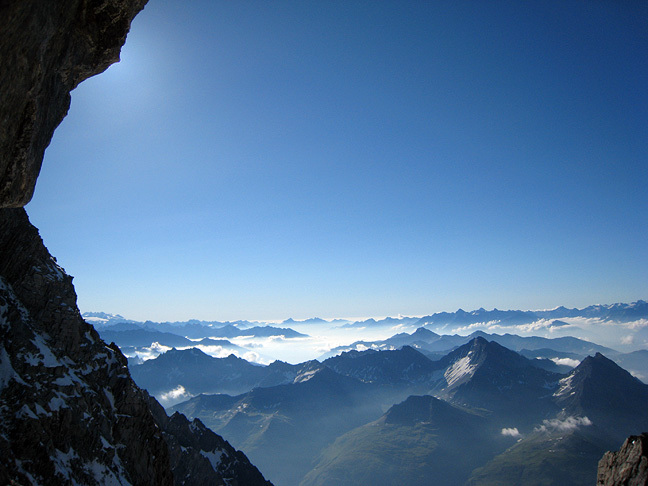 The Grand Combin in the distance. Residual mists veiled the nearby peaks along the ridge, which along with the rime ice on the rocks, lent a wintry atmosphere. In reality, in the calm air the sun was quite warm. 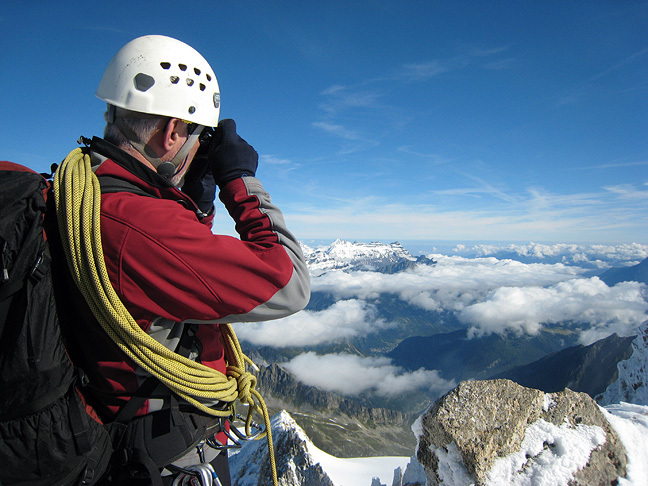 Here Ken enjoys the summit views. We weren't the only ones out at the first sign of improved weather! 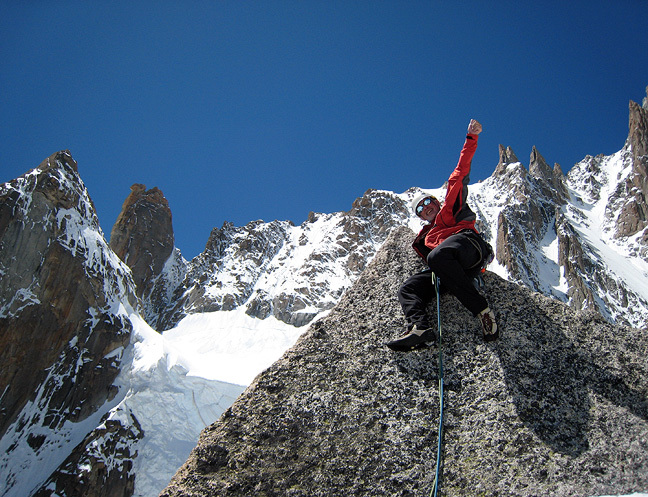 The Aiguille du Tour being an interesting climb, not too long and objectively safe, we had plenty of company after the long stormy week. Heading back down the glacier in beautiful, not-too-hot sunshine. 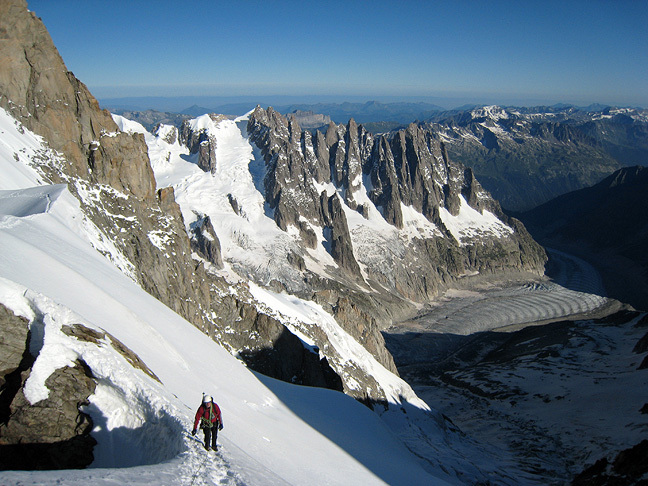 Next we headed up to the Géant Glacier, to climb the Pyramide du Tacul (shown here on right) on our way to the Torino hut. Beautiful granite, the snow rapidly melting off the ledges. Once again we were on the same route with Mark and co. (great minds think alike). 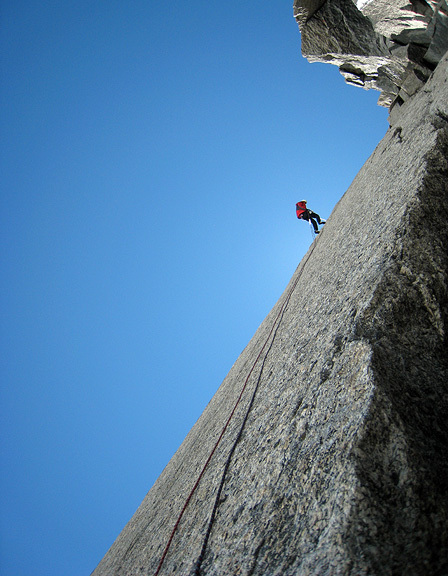 Kurt Green shown here belaying Mark. Incredible rock in an incredible location. And only two other parties on the route! 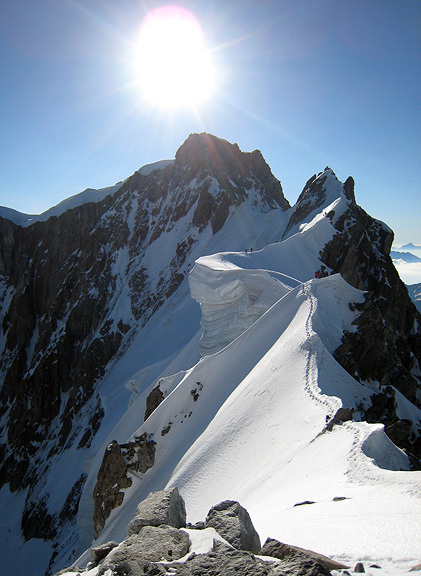 The scale of things is made real by the glacier crossers visible down on the snow in this photo. 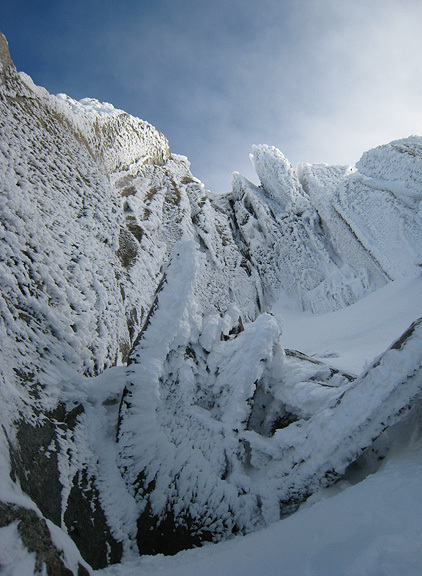 A brief pile-up at the crux pitch quickly cleared out. 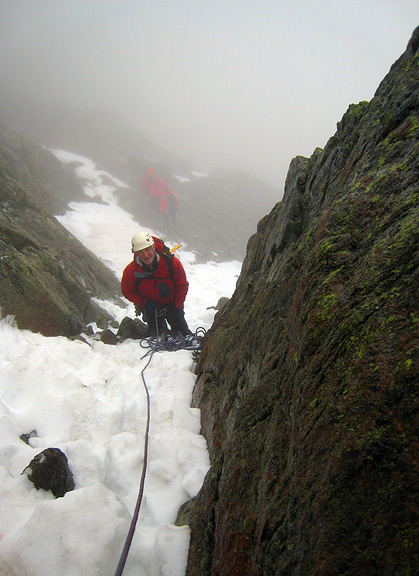 Turning the corner, the snow was a little slower to melt off the rock on this NE aspect. 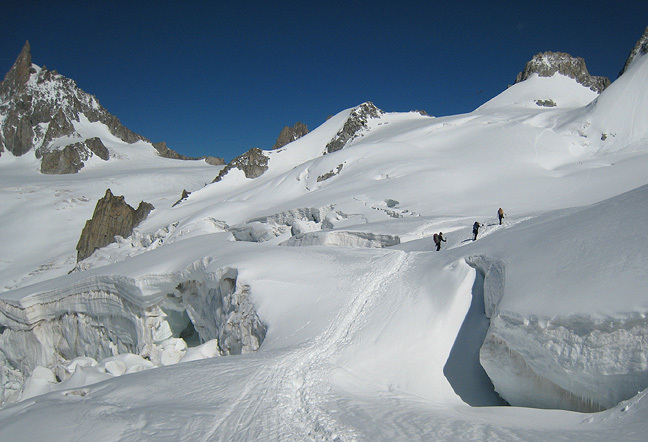 More tiny hikers on the glacier below, and the Mer de Glace visible in the far distance. It's a wee pointy summit! 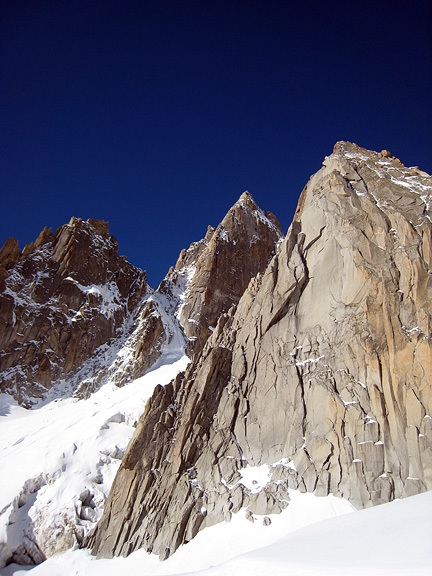 Despite the 10 or so pitches climbed, the Pyramide du Tacul is dwarfed by the over-looming East face of the Mont Blanc du Tacul and other nearby towers such as the Grand Capucin in the left background. 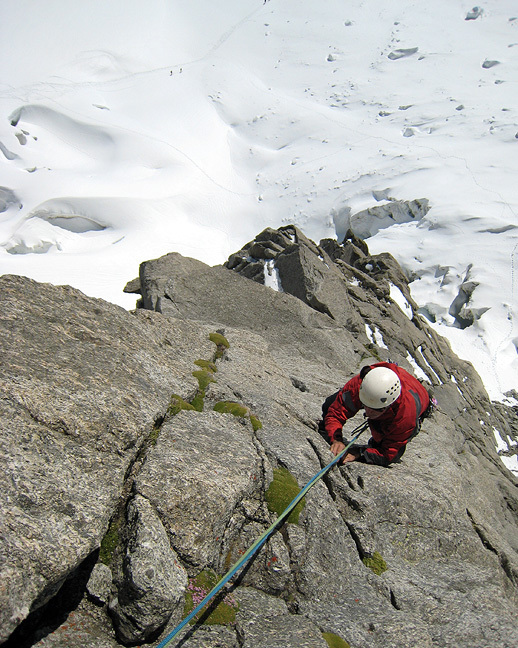 Steep long rappels bring us back to our alpine packs left at the base. 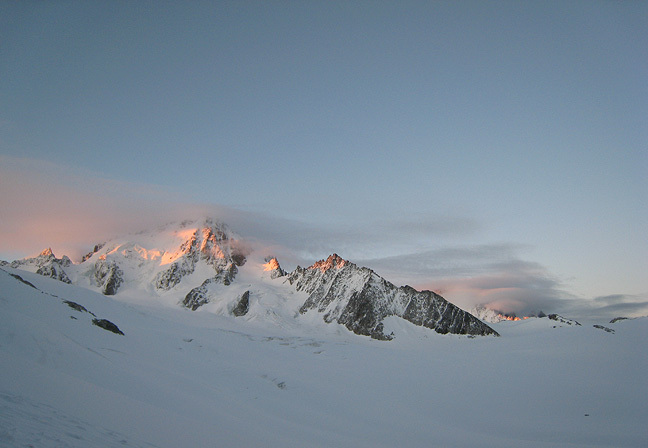 Then a long, hot walk up the glacier in the late afternoon to the Torino hut. 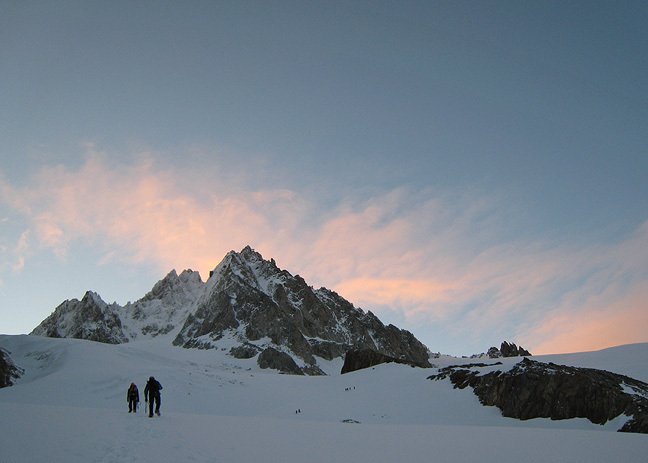 The following morning Kathy and Ken headed off for a traverse of the Aiguille d'Entrèves in a gorgeous sunrise. 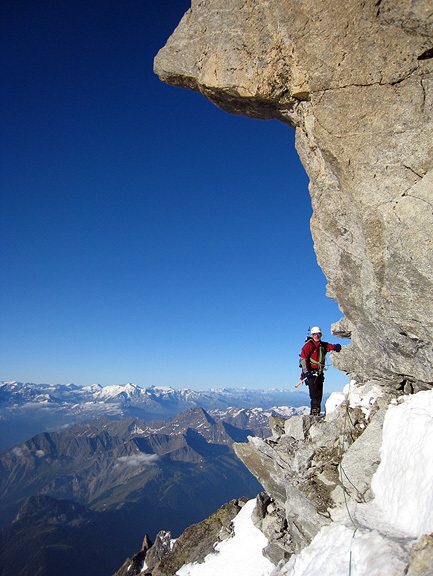 Quite tricky, intricate and exposed ridge-threading characterizes this climb, with a couple of tough fifth-class moves along the way. All too soon it was our last day. 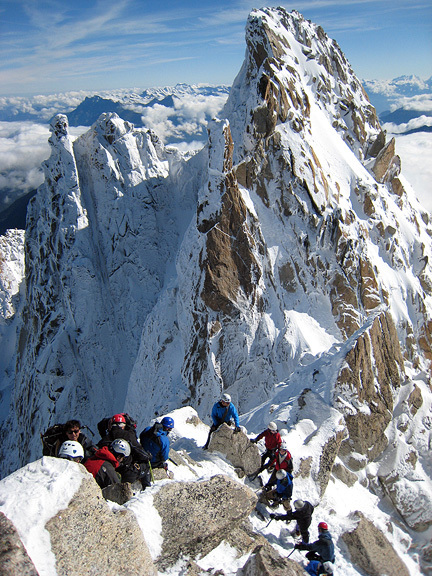 We headed up to the Rochefort Arête. 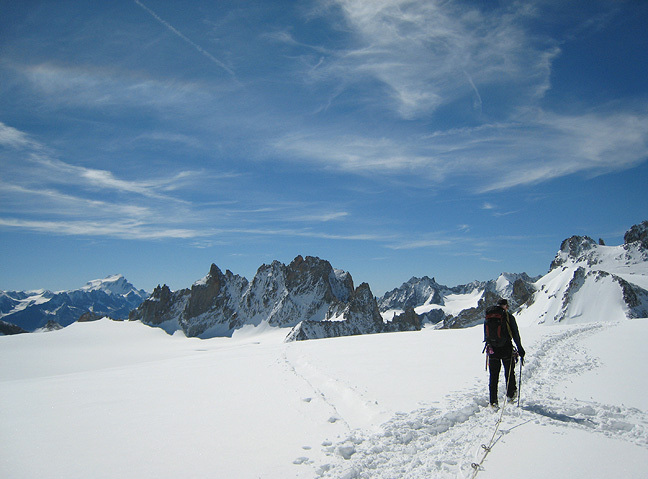 Much warmer temperatures set in suddenly, and the snow did not freeze at the level of the hut, though conditions were very good up higher on the route, as here where Ken approaches the "Salle à Manger". 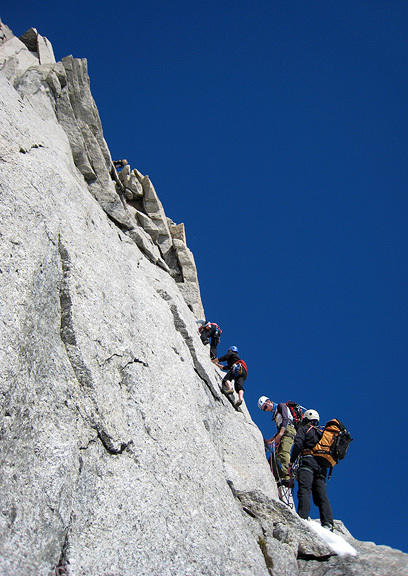 A very large crowd of climbers was well ahead of us mercifully, as we approached the airy sections of the ridge. Ken takes a breather at the "Salle à Manger". 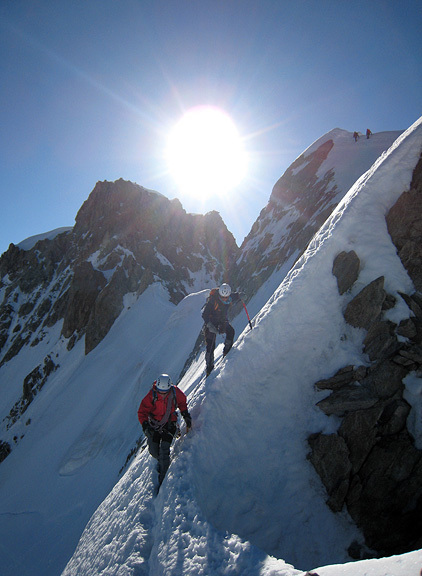 Two climbers carefully pick their way back down the steep, exposed flank of the ridge. Looking southeast into sunny Italy. 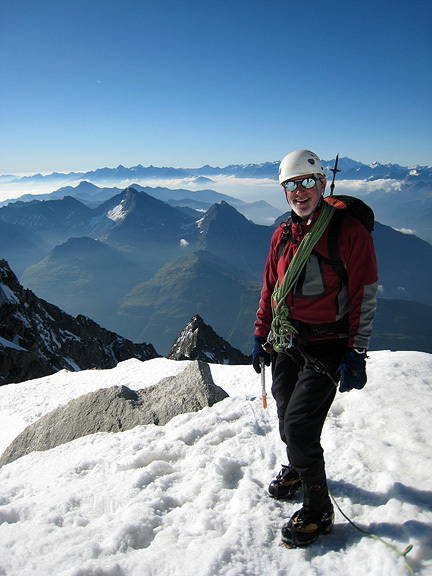 Ken still has plenty of scope for picking off a few more summits next year!